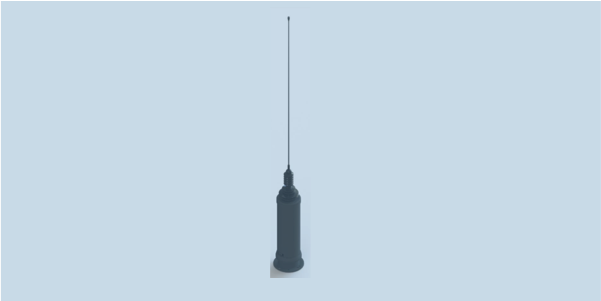 OMNI-A0223 antenna operates from 20 to 6000 MHz in three bands; Band A covers 20 to 520 MHz, Band B covers 500 to 2500 MHz and Band C covers 2000 to 6000 MHz. The whip is loaded along its length to control the antenna radiation patterns. It is thin and flexible over most of its length, with loads protruding slightly. The whip is spring loaded to give way when struck.